The band Dio(meaning 'God') was formed in 1982. Led by former Black Sabbath lead singer Ronnie James Dio, the band went through many changes in its' lineup. Some notable guitarists in the band were Vivian Campbell, Doug Aldrich, Tracy G, Jake E, Rowan Robertson, and most recently Craig Goldy. 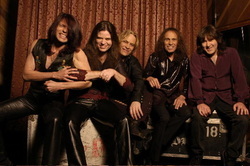 The group disbanded in 2010 when Ronnie James Dio passed away from a long battle with stomach cancer on May 16th, 2010.